First Year students in Honors take a year-long sequence that includes three of the classes listed below. Two Honors colloquia are required. These 200-level classes are offered each year in areas such as psychology, philosophy, and mathematics. Students may count any of Math 134, 135, 138, Chemistry 175, 176, or 225 in lieu of one colloquium. A minimum of two Honors seminars is required. Seminars are 300-level courses and are offered in an array of fields that change each year. 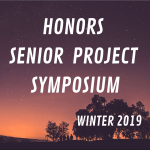 The Honors Senior Evaluation Checklist should be completed and submitted to Dr. Tristan Goldman or Dr. Scott Linneman prior to beginning a capstone project. This should be around the end of a student’s junior year. 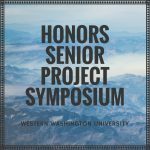 An Honors senior project is required for graduation through the Honors Program. This is concentrated work in a student’s major field. 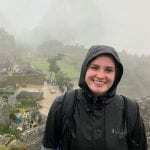 It is not unusual for a student to be engaged in senior project work before their final year, particularly for students in the natural sciences. To meet this requirement, students may take HNRS 490 – Senior Project, as well as classes in their major department. Honors students must maintain a minimum cumulative GPA of 3.5 for the last 90 graded credits of university level work.